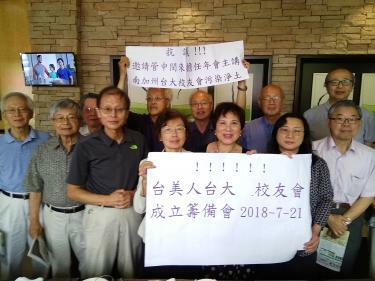 Members of the Southern California National Taiwan University Alumni Association opposed to the association’s decision to invite Academia Sinica member Kuan Chung-ming hold a news conference in Los Angeles on Saturday to announce the founding of a rival association. Academia Sinica academician and NTU president-elect Kuan Chung-ming (管中閔) yesterday reiterated that he will not back down from what he called a fight for National Taiwan University’s (NTU) autonomy against government intervention, in a speech at an annual gala held by the Southern California National Taiwan University Alumni Association in Los Angeles. Kuan was on Jan. 5 elected NTU president, but the Ministry of Education in April refused to appoint him amid allegations of plagiarism and a conflict of interest, as well as a flawed selection process. Since then, three administrative appeals have been filed — by NTU students, by the university and by Kuan himself — requesting that the ministry honor the election results and appoint him. When asked by the audience about his plans to tackle the controversy, Kuan said that he had considered giving up, but former NTU president Chen Wei-jao (陳維昭) changed his mind by telling him that the fight is less about who should be president and more about the university’s autonomy. “I will stand in solidarity with NTU in its fight for university autonomy and insist on not backing down,” he said. Anyone who supports him is supporting NTU and academic freedom, Kuan said, adding that he hopes to fight the establishment with the power of the public. Meanwhile, several members of the association at a news conference announced the founding of a separate alumni association in Los Angeles. The new association was founded because the original association insisted on inviting Kuan as the keynote speaker at the gala, despite opposition from fellow members, former association council member Lin Mei-li (林美里) said. More than 200 alumni issued a joint statement criticizing the association’s decision to invite Kuan, who said before his speech that the opposition prompted him to scrap about half of his speech. On Saturday, the Action Alliance for University Autonomy — which consists of 4,000 NTU students and faculty members — issued a joint statement with 13 other groups from universities nationwide, demanding that new Minister of Education Yeh Jiunn-rong (葉俊榮) respect the law. “We are extremely disappointed that Yeh has continued to criticize the election process and request a new vote,” they said, adding that the government should admit its mistake and complete the procedures for the NTU presidential election in accordance with the law. On Monday last week, when Yeh was inaugurated, a group of students that had filed an administrative appeal applied for a provisional injunction, requesting that the Taipei High Administrative Court order the ministry to temporarily appoint Kuan as NTU president until a ruling is made. Yeh has said that resolving the standoff is a priority. Before Yeh took office, the controversy led to the resignations of former education ministers Pan Wen-chung (潘文忠) in April and Wu Maw-kuen (吳茂昆) in May.